Many people shave to rid themselves of facial hair entirely or to reduce the amount to get a clean and neat look. While shaving is a relatively simple and inexpensive method of hair removal, it can have negative side effects. Razor burn can be both itchy and unsightly and end up looking worse than before you shaved. The accompanying nicks and cuts can be painful and can even get infected if not treated properly. Fortunately, using a product like Brut Aftershave can help limit these conditions. Not only can aftershave help repair your skin after shaving, but it can also improve both its quality and texture. A good quality aftershave will hydrate your skin and leave you feeling refreshed after a good shave. There are many aftershave products on the market comprised of different ingredients. They have different consistencies, offer different levels of hydration and come in a wide variety of scents. It can be difficult to know which one is right for the specific needs of your skin, and your particular shaving style. Choosing the right aftershave can help soothe and repair injured skin and also maintain it. There are products out there designed to reduce redness and irritation, and leave your skin feeling clean, smooth, and hydrated. 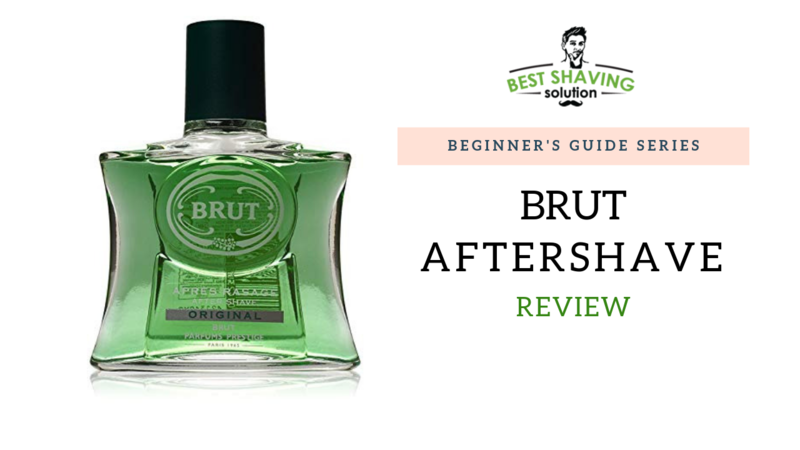 Brut Aftershave is a great, and cost-effective choice that has been used by generations of shavers. It has the same iconic fragrance as Brut fragrance products, but it's designed to leave a subtle, lingering aroma and not be overwhelming. We'll break down the ingredients in this product and explain how they help maintain and improve the quality of your skin after a shave. Brut Aftershave is part of the Brut line of men's grooming and fragrance products first launched in 1964 by Fabergé. One common concern when applying aftershave is that the fragrance will clash with your other grooming products. But because Brut offers a subtle scent, that's also available in a deodorant, antiperspirant, and cologne; you won't have to worry about that. Many aftershave products have the consistency of lotion or an even thicker body butter. While they may be easier to apply, many shavers find them to be greasy and difficult to absorb into their skin. Brut uses a liquid formula for its aftershave, making it simple to splash on after a shave. The product absorbs quickly into the skin, leaving behind the subtle and classic Brut fragrance. If you have oily skin, this makes it an even more ideal choice. You'll get enough hydration to soothe your skin without leaving it feeling greasy. Some shavers find themselves predisposed to getting nicks, cuts, and other forms of skin irritation while shaving. The menthol in Brut Aftershave helps to numb the affected area and provide soothing relief to the irritation. The alcohol acts as an astringent, preventing the chance of getting an infection due to shaving related injuries. Razor burn is a common complaint when shaving, and this product takes care of the lingering itchiness right away. After a shave, applying Brut Aftershave will leave your face feeling both soothed and refreshed. Unlike some of its competitors, Brut Aftershave includes alcohol in its formula. Although there are alcohol-free formulas available in different brands, there is a reason many popular aftershaves contain alcohol. It acts as an astringent which prevents infections caused by nicks and scratches caused by shaving. The astringent properties of alcohol ultimately help to reduce the amount of skin irritation shavers experience during the hair removal process. To help reduce the uncomfortable sensation of the damaged skin, the product also contains menthol which provides a numbing effect. 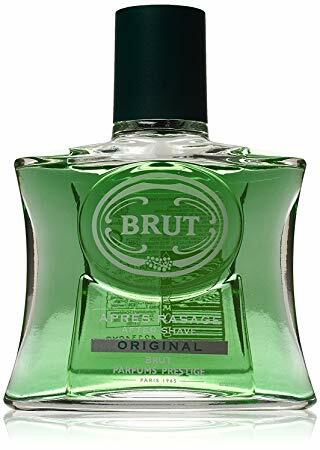 The scent of Brut Aftershave is best described as "classic. When compared to Brut cologne, you will find the scent to be less strong and more difficult to detect unless you're close to it. Although the scent is subtle, it's known to be long-lasting and popular. Even big stars such as Elvis Presley are known to have enjoyed the scent of Brut. Head coach of the Michigan Wolverines, Jim Harbaugh, even claims to have enjoyed the scent since he was ten years old. Although the fragrance has been around for decades, many find it refreshing and enjoyable even in modern times. It also contains propylene glycol, which acts as a humectant. This means it helps your skin stay hydrated over a long period of time after an application. It also reduces the chance that your skin will flake and helps keep its appearance supple. Aftershave products come in a wide variety of different consistencies. There are some which are as thick as body butter, and others that are more texturally similar to lotion. But Brut comes in a liquid formula which many people find easy to use. This makes it absorb quickly and easily into the skin, leaving no greasy residue behind. You'll be able to enjoy its soothing and moisturizing effects rapidly after applying it. When compared to the alternatives, it's hard to beat the price of Brut Aftershave. Although some shavers claim it's difficult to locate in stores, you can purchase it on Amazon.com for around $10 for a 5-ounce bottle. The Proraso Brand was founded in Italy in 1908 and soon became a staple of Italian culture. They've been producing shaving cream since 1948 and have been dedicated to creating professional quality products for the average consumer. Even professional barber, Calen Koenig swears by this high-quality product. Proraso After Shave Balm is a great way to get a barbershop quality shave at your own sink. It's available in a variety of different scents, each containing different ingredients designed to address certain skin issues. Choose from soothing aloe vera, a fresh minty scent, or oatmeal, green tea, and thyme which will help reduce redness after shaving. The consistency is creamy as opposed to oily although some users find it thinner when compared to other options. If you're a cruelty-free consumer, you'll be glad to know this balm contains no animal products. It also contains no paraben, silicones, mineral oil, or artificial colors. It's made of mostly natural ingredients designed to deliver maximum hydration. This includes the addition of Vitamin E and Aloe Vera to nourish and soften rough skin. Proraso After Shave Balm will soothe skin immediately after shaving and protect it from future damage. Lather & Wood After Shave Balm is a great option if you're one of the many shavers who struggle with razor burn. It contains no alcohol, which means no burning and stinging when dealing with irritated skin. This balm will leave even the most sensitive skin feeling cooled and refreshed after a shave. The lack of alcohol also makes the formula more hydrating than other options. Because of its unique ingredients and texture, it stands out from other brands and is great for customers looking for something different. This aftershave balm has a much thicker consistency than its competitors, but many shavers feel this to be a good thing. A small application goes a long way, and despite its thickness, it doesn't feel heavy or sticky when applied. Instead, it absorbs quickly into the skin, leaving your face feel smooth and soothed of any irritation. Even customers who have oily skin find Lather & Wood After Shave Balm to work well for them and not leave a greasy residue on the skin. It has a pleasant sandalwood scent, but some may consider it too subtle when compared to other options. Another great option for those with sensitive skin is Baxter of California After Shave Balm. It doesn't contain alcohol, so it won't sting when applied to irritated skin. To combat further redness and irritation, it contains a compound called allantoin. The lack of alcohol also prevents skin from drying out, and the addition of glycerin helps add moisture back to the skin. It's designed to absorb into your skin quickly, and the aloe vera and tea tree oil leave you feeling refreshed following your shave. Compared to other aftershave balms, Baxter of California contains a higher amount of synthetic ingredients. The paraben on the ingredient list may be enough to put off those customers who prefer to choose more natural skin care options. However, the ingredients are designed to both hydrates the skin and prevent signs of aging and eliminate redness and ingrown hairs. If you're not opposed to using synthetic ingredients, Baxter of California After Shave Balm is a great option that leaves behind a zesty citrus and mint scent. Brut Aftershave is a classic product that has been around for a long time, and it's easy to see why it's remained popular over the years. While other aftershaves contain a plethora of different ingredients, Brut offers a simple yet effective product that is easy to apply to your skin. Its liquid form allows it to provide hydration without leaving your skin feeling greasy and over saturated. Just a small amount of this product goes a long way towards soothing and improving the quality of your skin. That combined with its low price point makes it an unbeatably great value when compared to other alternatives. If you tend to acquire nicks and cuts no matter how carefully you shave, the alcohol in this aftershave will help prevent them from getting infected. Meanwhile, the menthol will help soothe your skin, and leave you feeling refreshed. Other aftershaves omit alcohol and menthol because of the sensation they cause after application. But these ingredients help eliminate post shave itching and the potential hazard effects of razor burn. Another frequent complaint from shavers is their skin feeling dry and flaking after a shave. This aftershave will moisturize your skin quickly and provide a long-lasting hydrating effect. In addition, it's formulated to leave your skin feeling soft. Aftershaves come in a wide variety of different scents, but it's hard to beat the aroma of Brut. Many people find it nostalgic, and it's been worn by celebrities like Elvis Presley in the past. It's easy to see why it's such a popular, iconic scent. If you're a fan of Brut cologne, you can get a more subtle but just as long lasting scent by using this aftershave. In fact, because Brut carries such a wide range of products, you don't have to worry about the fragrance clashing with that of your deodorant if you stay loyal to the brand. Although it can be a challenge to find bottles in stores, it's easy enough to find online at an affordable price. When considering the quality, scent, and price point, it's easy to see why we rate Brut Aftershave 5/5 Stars.